Published 2004, Bioscience 54(4): 321-330. Invertebrate species represent more than 99% of animal diversity; however, they receive much less publicity and attract disproportionately minor research effort relative to vertebrates. Nonmarine mollusks (i.e., terrestrial and freshwater) are one of the most diverse and imperiled groups of animals, although not many people other than a few specialists who study the group seem to be aware of their plight. Nonmarine mollusks include a number of phylogenetically disparate lineages and species-rich assemblages that represent two molluscan classes, Bivalvia (clams and mussels) and Gastropoda (snails, slugs, and limpets). In this article we provide an overview of global nonmarine molluscan biodiversity and conservation status, including several case studies documenting the diversity and global decline of nonmarine mollusks. We conclude with a discussion of the roles that mollusks and malacologists should play in conservation, including research, conservation management strategies, and education and outreach. Invited public lecture during the Philadelphia Shell Show, 3 October 2004, Academy of Natural Sciences, Philadelphia, Pennsylvania. The purpose of this lecture was to provide an interesting and entertaining introduction to freshwater malacology to a general audience. Many aspects of freshwater mollusks were addressed in detail, including morphological diversity, reproductive habits, evolution and conservation issues. 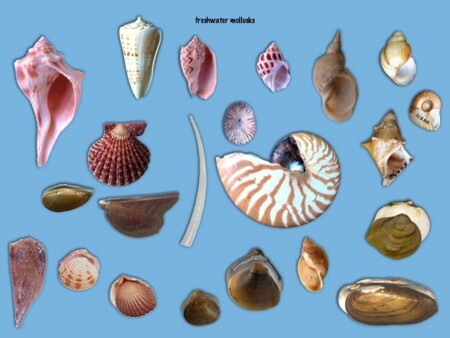 This slide depicts only a portion of the range of shell morphology deplayed by both marine and freshwater mollusks. Lecture presented at a special symposium, "Mussels in America  Shells of their Former Selves," at the annual meeting of the American Fisheries Society, 22-26 August 2004, Madison, Wisconsin. Abstract. One of the most frustrating things about beginning a new field of study is knowing where to find information. Today, many resources on freshwater mollusks are available to the beginning researcher, a large part of which is available on the web. A review of the kinds of resources available and their location will be presented. Included will be links to a bibliography of over 14,000 citations on freshwater mollusks, a freshwater mussel/fish host database, a list of systematic research collections and their respective curators, on-line catalogues of specimens, field guides, checklists, keys, photographs, societies and journals, listservers, contacts/researchers, past malacologists, exotic species, and outreach sites. A summary of the most often used references will be discussed. A new effort to try and bring some order to the overwhelming number of scientific names of freshwater mussels called the MUSSEL Project will also be presented. The MUSSEL Project is an on-going study aimed at the global revision of the classification of freshwater mussels. Toward this end, an exhaustive database of all recent mussel species and genera described to-date is being assembled. This database will eventually serve as the basis for a universal synthesis and revision of freshwater mussel taxonomy. Abstract. Freshwater mussels of the bivalve order Unionoida are an ancient, widespread and diverse group of mollusks. However, the region of greatest species diversity is the eastern half of the North American continent. Recent cladistic analyses have shown that the Nearctic mussel assemblage is comprised of representatives of at least four distinct lineages: Anodontini, Gonideini, Ambleminae and Margaritiferidae. The global phylogenetic and biogeographic contexts for these clades will be discussed. The geographical distribution of the Anodontini and their phylogenetic position. Lecture presented at a special symposium, "Bivalve Systematics - a look at the branches," at the World Congress of Malacology, 11-16 July 2004, Perth, Western Australia. This lecture was also presented as part of the ANSP Seminar Series on 8 October 2004. Abstract. The Palaeoheterodonta is a diverse clade consisting of the freshwater bivalve order Unionoida and its marine sister group, Neotrigonia. Neotrigonia is the sole surviving member of Trigonioida, known today from only 6 species restricted to Australian waters. 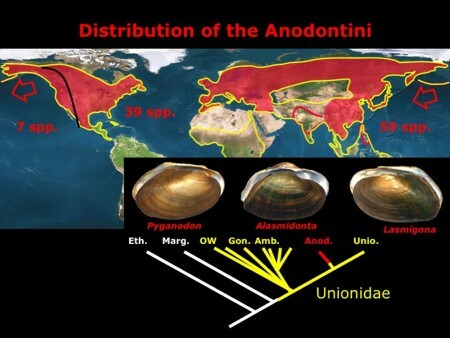 Unionoids (also known as freshwater mussels), on the other hand, are widely distributed on all continents except Antarctica, and are represented by nearly 900 species divided among 6 families. Discussions of palaeoheterodont diversity are numerically biased towards the freshwater mussel condition, but Neotrigonia is crucial as a 'living fossil' for establishing the plesiomorphic states for characters crucial to unionoid systematics. In fact, based on recent cladistic studies, Neotrigonia appears to retain many of the characters of the ancestral heteroconch. Based upon recent cladistic studies of both molecular and morphological data, we present a summary phylogeny of freshwater mussels emphasizing synapomorphies and sister-relationships. The Unionoida is monophyletic based upon several synapomorphies, including presence of parasitic larvae, parental care (i.e., brooding) and restriction to freshwater. The order is composed of six families divided between two superfamilies, Unionoidea and Etherioidea: ((Unionidae, Margaritiferidae), (Hyriidae, (Iridinidae, (Mycetopodidae, Etheriidae)))). This family-level phylogeny deviates from the one traditionally preferred but is supported by most cladistic analyses. The synapomorphies of these taxa, as well as problematic genera, are discussed. Understanding the current, global diversity of the Unionoida is complicated by the absence of cosmopolitan treatments of freshwater mussel genus- and species-level assessments. Based upon our own syntheses of numerous provincial studies of freshwater mussel taxonomy, analyses of unionoid diversity in space and time are discussed with twin goals of synthesis and highlighting outstanding problems. 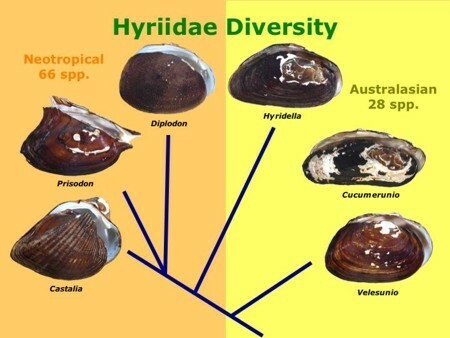 Slide showing the relationships among the two geographical groups of hyriids and a slice of their spectrum of conchological variation.